I'm sure you've all either been told to read the directions or told someone else to read them. I remember teachers who played little tricks on us to make sure we were reading the directions. Remember the ones who would put, "Read all the directions before beginning the test" in the directions and then, at the end of the directions you were told to only answer one question or something like that? It worked. I've been reading directions since. Well, most of the time. Ok, I read them AFTER I try to do something on my own first. But still, I get the importance of reading the directions. I think about this sometimes when I read blogs and see comments made that most assuredly indicate the comment was written by someone who did not read the entire post. It's like they read the title or part of the post and assumed the rest and commented. I've had it happen at my blog as well. I even know people who are like this in actual, verbal conversations. You make a statement and they assume where you're going and BOOM! They go there for you. Only that's not even close to where you were headed. I realize that sometimes we simply misunderstand or miss the point that is being made. But we really can't claim that when we haven't read the entire post. Or news article. Or email. Or message. Or listened to the conversation. If we haven't read the directions. So, do y'all read the directions? 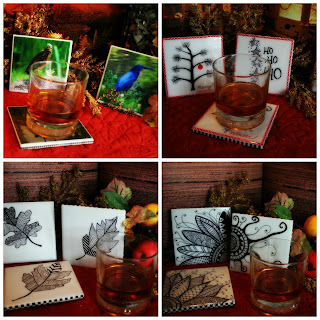 I've adjusted the shipping so it should be less expensive now to ship your coasters to you! If you're in the US it should only cost $6.10! There are plenty of sets for your viewing pleasure! Let me know if you have a question! I do read instructions and earlier this week someone left a comment on my blog that had nothing to do with anything I had written. Just shook my head. I'm sure I've done it too, though not on purpose. I do tend to read the entire post before commenting. It wasn't you, by the way!! And I apologize if I've done it on yours!! Hahaha! You've never done it here. I had it happen with a blogger from the challenge that I dropped. If they don't want to read, they could just not comment or write something like, Nice post, you know? Oh well. Thanks! Have a great weekend! I don't always read the directions. Most of the time I at least look them over. I recall putting together a BBQ grill once and it had the best directions I had ever seen. Also, skipping and doing the steps in the wrong order would be a problem on that one. Now people jumping to conclusions before you have finished is very irritating and the start of many arguments. I do notice people always wanting to rush through everything. Maybe I've just slowed down more. I'm not sure. Reading the directions is so annoying but I know I have to do it. Maybe that's why I try to never buy anything that has to be put together. Not to mention step 7 is never, really, step 7 and the picture never looks like the actual product and...Ha! I know I've got to slow down on things other than my walking speed. LOL Thanks!